Teach your dog what he/she needs to know to become evaluated as a Therapy dog!! Your dog should have some basic commands such as sit and come to join this class. This class will teach your dog everything he/she needs to earn to be a therapy dog. 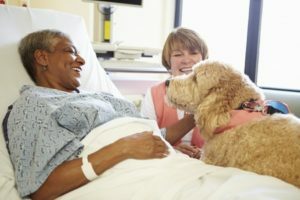 Similar to our Canine Good Citizen class, the Therapy Dog class teaches your dog how to stay calm during a variety of situations such as how to except strangers politely and how to stay for long periods of time. Once you pass the evaluation course with us, you must complete 10 hours of time visiting public area’s such as nursing homes etc. This class has four sessions. All classes are held on Saturdays at our East Smithfield location. $55 for ACS adopters, $65 for Non-ACS adopters. Proof of rabies and distemper shots must be sent before classes are held.